Angular provides life cycle hook ngOnInit by default. Why should ngOnInit be used, if we already have a constructor? 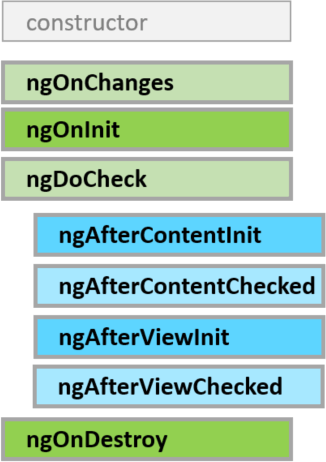 ngOnInit is a life cycle hook called by Angular2 to indicate that Angular is done creating the component. then to use the method of OnInit we have to implement in the class like this. Implement this interface to execute custom initialization logic after your directive's data-bound properties have been initialized. ngOnInit is called right after the directive's data-bound properties have been checked for the first time, and before any of its children have been checked. It is invoked only once when the directive is instantiated. Mostly we use ngOnInit for all the initialization/declaration and avoid stuff to work in the constructor. The constructor should only be used to initialize class members but shouldn't do actual "work". So you should use constructor() to setup Dependency Injection and not much else. ngOnInit() is better place to "start" - it's where/when components' bindings are resolved. The article The essential difference between Constructor and ngOnInit in Angular explores the difference from multiple perspectives. This answer provides the most important difference explanation related to the component initialization process which also shows the different in usage. The constructor of the component is called when Angular constructs components tree. All lifecycle hooks are called as part of running change detection. When Angular constructs components tree the root module injector is already configured so you can inject any global dependencies. Also, when Angular instantiates a child component class the injector for the parent component is also already set up so you can inject providers defined on the parent component including the parent component itself. Component constructors is the only method that is called in the context of the injector so if you need any dependency that's the only place to get those dependencies. When Angular starts change detection the components tree is constructed and the constructors for all components in the tree have been called. Also every component's template nodes are added to the DOM. The @Input communication mechanism is processed during change detection so you cannot expect to have the properties available in the constructor. It will be available on after ngOnInit. Only then runs change detection and updates bindings for the my-app and calls ngOnInit on the MyAppComponent class. Then it proceeds to updating the bindings for the child-comp and calls ngOnInit on the ChildComponent class. You can do your initialization logic in either constructor or ngOnInit depending on what you need available. For example the article Here is how to get ViewContainerRef before @ViewChild query is evaluated shows what type of initialization logic can be required to be performed in the constructor. I think the best example would be using services. Let's say that I want to grab data from my server when my component gets 'Activated'. Let's say that I also want to do some additional things to the data after I get it from the server, maybe I get an error and want to log it differently. It is really easy with ngOnInit over a constructor, it also limits how many callback layers I need to add to my application. with my constructor I could just call my _userService and populate my user_list, but maybe I want to do some extra things with it. Like make sure everything is upper_case, I am not entirely sure how my data is coming through. So it makes it much easier to use ngOnInit. It makes it much easier to see, and so I just call my function within my component when I initialize instead of having to dig for it somewhere else. Really it's just another tool you can use to make it easier to read and use in the future. Also I find it really bad practice to put function calls within a constructor! Look at the below chart I created which shows the lifecycle of Angular. In Angular2+ we use constructor to do the DI(Dependency Injection) for us, while in Angular 1 it was happening through calling to String method and checking which dependency was injected. As you see in the above diagram, ngOnInit is happening after the constructor is ready and ngOnChnages and get fired after the component is ready for us. All initialisation can happen in this stage, a simple sample is injecting a service and initials it on init. // ngOnInit, get called after Component initialised! The first one (constructor) is related to the class instantiation and has nothing to do with Angular2. I mean a constructor can be used on any class. You can put in it some initialization processing for the newly created instance. Constructor : constructor is a default method runs (by deafult) when component is being constructed. When you create an instance of a class that time also constructor(default method) would be called. So in other words, when component is being constructed or/and an instance is created constructor(default method) is called and relevant code written within is called. Basically and generally in Angular2 it used to inject things like services when component is being constructed for the further use. OnInit: ngOnInit is component's life cycle hook which runs first after constructor(default method) when component is being initialized. So, Your constructor will be called first and Oninit will be called later after constructor method. You can check this small demo which shows implementation of both things. I will just add one important thing that was skipped in the explanations above and explains when you MUST use ngOnInit. If you are doing any manipulation of the component's DOM via e.g. ViewChildren, ContentChildren or ElementRef, your native elements will not be available during the constructor phase. However, since ngOnInit happens once the component has been created and the checks (ngOnChanges) have been called you can access the DOM at this point. 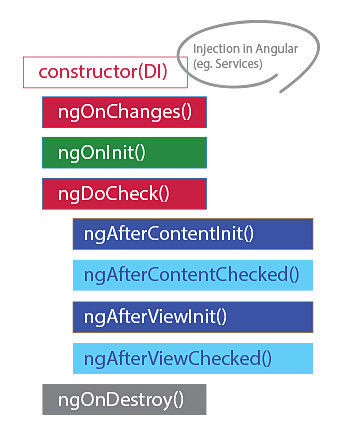 The main difference between constructor and ngOnInit is that ngOnInit is lifecycle hook and runs after constructor. Component interpolated template and input initial values aren't available in constructor, but they are available in ngOnInit. The practical difference is how ngOnInit affects how the code is structured. Most initialization code can be moved to ngOnInit - as long as this doesn't create race conditions. A substantial amount of initialization code makes constructor method hard to extend, read and test. The primary role of class constructors in Angular is dependency injection. Constructors are also used for DI annotation in TypeScript. Almost all dependencies are assigned as properties to class instance. Average component/directive constructor is already big enough because it can have multiline signature due to dependencies, putting unnecessary intialization logic to constructor body contributes to the antipattern. If there are race conditions (including the one that a component shouldn't appear on initialization error), asynchronous initialization routine should take place before component instantiation and be moved to parent component, router guard, etc. ngOnInit is more flexible than a constructor and provides some benefits for unit testing that are explained in detail in this answer. Considering that ngOnInit isn't called automatically on component compilation in unit tests, methods that are called in ngOnInit can be spied or mocked after component instantiation. In exceptional cases ngOnInit can be entirely stubbed to provide isolation for other component units (for instance, some template logic). Child classes can only augment constructors, not replace them. Since this cannot be referred before super(), this puts restrictions on initialization precedence. This would be impossible to implement with constructor alone. Like a lot of other languages, you can initialize variables at the class level, the constructor, or a method. It is up to the developer to decide what is best in their particular case. But below are a list of best practices when it comes to deciding. Usually, you will declare all your variables here that will be used in the rest of you component. You can initialize them if the value doesn't depend on anything else, or use const keyword to create constants if they will not change. this will automatically create the class level variables, so you will have access to customService.myMethod() without having to do it manually. NgOnit is a lifecycle hook provided by the Angular 2 framework. Your component must implement OnInit in order to use it. This lifecycle hook gets called after the constructor is called and all the variables are initialized. The bulk of your initialization should go here. You will have the certainty that Angular has initialized your component correctly and you can start doing any logic you need in OnInit versus doing things when your component hasn't finished loading properly. If you are using Angular 2 framework and need to interact with certain lifecycle events, use the methods provided by the framework for this to avoid problems. The above answers don't really answer this aspect of the original question: What is a lifecycle hook? It took me a while to understand what that means until I thought of it this way. 1) Say your component is a human. Humans have lives that include many stages of living, and then we expire. 2) Our human component could have the following lifecycle script: Born, Baby, Grade School, Young Adult, Mid-age Adult, Senior Adult, Dead, Disposed of. 3) Say you want to have a function to create children. To keep this from getting complicated, and rather humorous, you want your function to only be called during the Young Adult stage of the human component life. So you develop a component that is only active when the parent component is in the Young Adult stage. Hooks help you do that by signaling that stage of life and letting your component act on it. Fun stuff. If you let your imagination go to actually coding something like this it gets complicated, and funny. That is why there is ngOnInit lifecycle hook in Angular.ngOnInit renders when Angular has finished initialising the component. First we instantiate the class as below which happen to immediate runs of constructor method. But you may ask why we are using constructor in Angular? Constructor is called whenever an object is created of that class. ngOnInit called once the component is created. Both methods have different goals/responsibilities. The task of the constructor (which is a language supported feature) is to make sure that the representation invariant holds. Otherwise stated to make sure that the instance is valid by giving correct values to the members. It is up to the developer to decide what 'correct' means. The task of the onInit() method (which is an angular concept) is to allow method invocations on a correct object (representation invariant). Each method should in turn make sure that the representation invariant holds when the method terminates. The constructor should be used to create 'correct' objects, the onInit method gives you the opportunity to invoke method calls at a well defined instance. constructor() is the default method in the Component life cycle and is used for dependency injection. Constructor is a Typescript Feature. ngOnInit() is called after the constructor and ngOnInit is called after the first ngOnChanges. as mentioned above ngOnChanges() is called when an input or output binding value changes. I think that onInit is like InitialComponents() in winForm . 1) Angular injector detect constructor parameter('s) and instantiate class. ngOnChanges --> Call in directive parameters binding. Call other method with state of angular life-cycle. I found the answer and I tried to translate it to english: This question still arised, even in technical interviews. In fact, there is a big resemblance between the two, but also there are some differences. The constructor is part of ECMAScript. On the other hand ngOnInit() is a notion of angular. In the constructor we can not call HTML elements. However, in ngOnInit () we can. constructor() is used to do dependency injection. ngOnInit(), ngOnChanges() and ngOnDestroy() etc. are lifecycle methods. ngOnChanges() will be the first to be called, before ngOnInit(), when the value of a bound property changes, it will NOT be called if there is no change. ngOnDestroy() is called when the component is removed. To use it, OnDestroy needs to be implemented by the class. Not the answer you're looking for? Browse other questions tagged angular typescript constructor ngoninit or ask your own question. What is the difference if I create something in constructor vs ngOnInit? What is the practical difference between using ngOnInit and constructor in Angular 2 Component definition? Can anyone please explain how the execution hierarchy of differant blocks such as constructor, ngOninit, View … etc in angular2? When to create constructor in Angular2 typescript? What is the difference between Angular ngOnInit() and ngOnChanges()?